Grand Theft Auto: Liberty City Stories is one of my favorite games for the PlayStation portable. Why? Because as a teenager I used to love playing GTA: Vice City. Unfortunately nowadays I rarely have enough free time for gaming. Luckily the PlayStation Portable has a perfect solution: I can play almost all of my favorite games on the go whenever I need to take a break from work or other everyday activities. I love open world games where I am free to cause all sorts of trouble. And while Liberty City stories doesn’t take place in my favorite city, Vice City, the game still allows me to let off some of the steam by punching an unsuspecting pedestrian in the face or beating up a cop with a baseball bat. Hijack a bunch of cars, line ’em up nicely and blast ’em with a rocket launcher- a perfectly normal way to spend the afternoon, don’t you agree? Doing missions for respect and money is one thing, but soon enough you will get tired of all that. I promise. Eventually you will find yourself wandering around town causing all sorts of carnage just for kicks. But even that can get tiring after a while. Fortunately the game comes with some pretty decent built in cheats that you can use to make the gameplay a little more interesting. For example, would you fancy every driver in the game drive their car like you instead of being a model citizen? Below is a list of my all time favorite cheats for GTA Liberty City Stories. There are more than what I have listed here of course, but most other cheats are plain crap compared to these. When you combine all of the cheats below I will guarantee that you’ll have yourself a pretty insane setup. Use the Aggressive Drivers cheat below to make the drivers, well, more aggressive. When you activate this cheat all the drivers in the game ride around recklessly. They drive over pedestrians, ignore red lights, bump into others for no reason and go way above the speed limit. All in all they will drive just like You! Fancy playing a God? With the Destroy All Cars cheat you can easily blow up every vehicle around you in one swift move. Be careful not to blow yourself up in the process! You can easily make the police look the other way with the Never Wanted cheat. When active, no matter how much trouble you cause, the police, the secret service and the military will all leave you alone. Go on a killing spree without being shot down! Most pedestrians in GTA are wussies. They get scared easily and run away when you shoot at ’em. How would you like to make them more violent, just like you? When you activate the Pedestrians Attack You cheat, all the pedestrians around you will come running towards you in rage and fury! Having more aggressive pedestrians in the game is great, but most of them come at you swinging their bare fists which is kinda boring if you ask me. When you activate the Pedestrians Have Weapons cheat, however, you give them a fighting chance against you. Once active all the pedestrians carry random weapons. Yes, that includes the rocket launcher. With all of the above cheats combined, this is the final step towards a city-wide apocalypse. When you activate the Pedestrians Riot cheat the entire town goes batshit crazy! You will see people breaking stuff, stealing stuff, beating each other up and driving recklessly in their cars. In my opinion this cheat is best combined with the Pedestrians Have Weapons cheat. The best way to fit in is to look like everyone else. When you activate the Random Pedestrian outfit your character will turn into a random pedestrian. Keep applying the cheat until you get your favorite! There are quite a few handy weapons in GTA: Liberty City Stories. You can unlock all of them by using the three cheats below- each one unlocks a set of weapons to inflict pain upon your enemies. The choice of the weapons set depends largely on your overall gaming style. Most INSANE setup for gameplay? 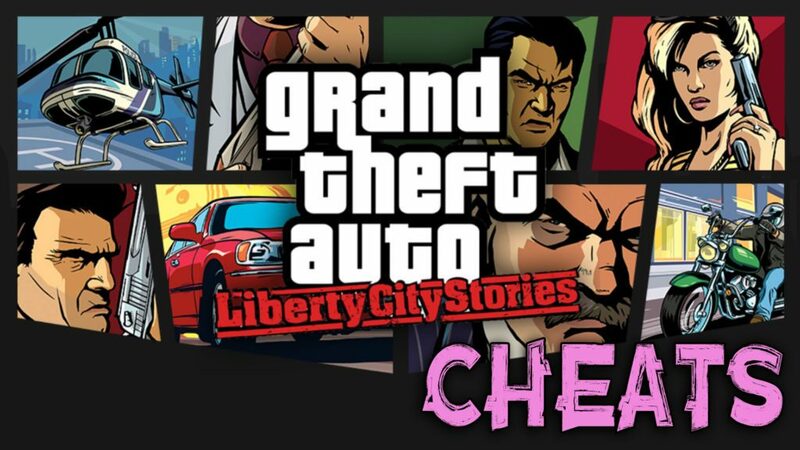 With the list of my favorite cheats for GTA: Liberty City Stories above you can enjoy one of the most insane gaming setups possible within the game without hacks or mods. As you can see I excluded the Never Wanted cheat to make the game even harder. Not only do you have to handle the mad pedestrians, you’ll also have to watch out for the police. Can you make it from one side of the map to the other in one piece?